Olympic athletes (L-R) Simone Biles, Aly Raisman, Laurie Hernandez and Madison Kocian pose with Kim Kardashian West (C) at the 2016 MTV Video Music Awards at Madison Square Garden on August 28, 2016 in New York City. Simone Biles scored the selfie she hoped to get at the 2016 MTV VMAs. 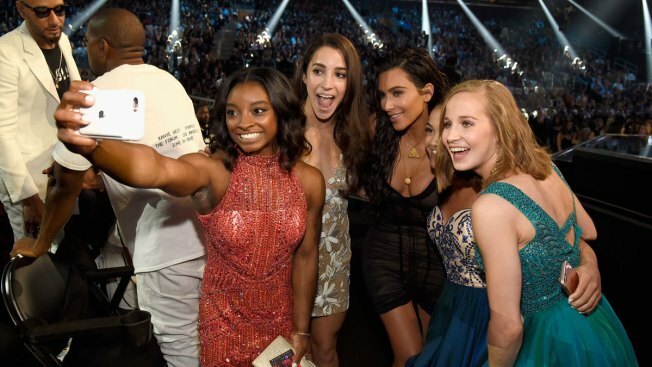 Biles, Laurie Hernandez, Aly Raisman and Madison Kocian met Kim Kardashian during the awards show Sunday night, and of course they snapped a couple of photos to commemorate the moment. Kim shared the adorable pics on her Snapchat soon after, letting everyone know that Biles got her wish. The gold medal-winning Olympian shared Saturday that she was hoping to meet the "Keeping Up With the Kardashians" star. "I have planned tomorrow at the VMAs to meet Kim Kardashian, and then I'm gonna send her daughter some [leotards]," Biles said at the Houston Methodist Willowbrook Hospital. Do you hear that, Kim? Biles can help North West become a little Olympian. All of the gymnasts had ear-to-ear grins as they posed next to Kim, who also had a large smile on her face as well. While snapping a selfie with Simone, however, Kim gave the camera her famous duck face. It's been one heck of an evening for Kim, whose husband Kanye West stood on stage earlier to present his new music video for "Fade."